Late entries: $20.00 per horse/rider combo for entries postmarked after the closing date. Changes: $5.00 per change made after the closing date. Returned checks: $40.00 fee; no further checks accepted until the matter is cleared up. Mail entries to the Show Secretary listed for the show you are entering. Do not mail to the show venue or show manager. 2. IEO Liability Release form. One form per show must be signed by competitor. (Form must be signed by parent/guardian for riders under 18). 3. Photocopy of negative Coggins test dated within one year of show date; Copy of Coggins will be kept on file for current show season. No refunds of any class/show fees will be made after the closing date, including for class cancellations due to acts of God, acts of terrorism, inclement weather, and/or other emergencies. Ride times: Available the Wednesday prior to the show at http://www.ieodressage.org or from the show secretary. Sometimes changes are made to the schedule prior to the show day. It is the exhibitor’s responsibility to check the website for changes prior to the show day. 1. Classes 1-2 will be held as “flat classes” with all horse and rider combinations in the ring together. 2. Any Class can be combined or split at the organizer’s discretion. 3. All classes will be held in the large 20 x 60 arena. 5. 2019 USDF Intro Tests, 2019 USEF Tests, 2018 USEA Tests, and 2017 Western Dressage tests found on USEF website will be used. horse by a competitor or an exhibitor, which are deemed excessive by a judge, or show management, in the competition ring or anywhere on the competition grounds may be punished by official warning, elimination, or other sanctions which may be deemed appropriate by the show committee. Anyone observing what they feel is abusive conduct not in the best interest of the horse should report it to the show manager. Reports will remain anonymous. 7. A horse is limited to 4 tests/classes at a show. Same horse/rider combo is limited to 3 tests/classes. Horses may only be shown at 2 consecutive levels at any one show (i.e. intro/training, training/first, first/second). Even if the horse has 2 different riders this rule still applies (i.e. Rider A does training level and Rider B can only do intro or first level), with the exception of musical freestyle, pas de deux, and quadrille. 8. Entries must be postmarked by the declared postmark/closing date. The closing date for each show is posted with show information, usually 1-2 weeks before the show date. Entries are to be accepted on a “first come, first served” basis. Fully complete entries receive priority. To be considered complete, entries must include completely filled out and legible entry form, copy of current Coggins unless on file, signed release and correct fees. Incomplete entries or those postmarked after the closing date may be put on a waiting list. Note that IEO Members will be given waitlist preference over nonmembers see 8a. a) A LATE FEE OF $20.00 PER HORSE/RIDER COMBINATION WILL BE CHARGED FOR ENTRIES POSTMARKED AFTER THE CLOSING DATE. If the late fee is not included with the entry, then it must be paid before receiving packet, if entry is accepted. In the event of over subscription, members of the IEO will have priority provided their complete entry was received before the closing date. b) Any person riding a horse on the show grounds needs to fill out and sign a release unless the rider is a boarder at the show venue and is not competing. The release must be on file for each show at the secretary’s stand. c ) Anyone bringing a non-competing horse must pay a $25 fee. 9. $5 fee per ride will be assessed to anyone requesting changes after the closing date. Special requests for ride times will be honored only at the Secretary’s discretion. Please limit your requests, as this is a difficult process. 10. Braiding is optional and regular show attire is requested. If you do not wish to wear show attire, please wear conservative clinic attire, i.e. shirts of conservative color, with no neckwear, breeches or jodhpurs of conservative color, and appropriate riding boots. 11. Tests may be read aloud except for FEI tests. Provide your own reader, please. 12. Tests will not be given out until the classes are pinned. Please do not ask at the secretary’s stand until then. It is the rider’s responsibility to pick up tests/ribbons. 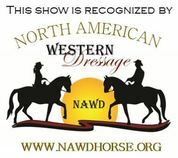 Tests only will be mailed if rider provides self- addressed stamped envelope OR tests/ribbons can be picked up at the next show. 13. Shows will be run as closely as possible to USEF rules. It is the judge’s and/or show management’s discretion to eliminate riders based on illegal use of equipment. (bits ,whips, spurs, etc.) . USEF legal length (120 cm) whips may be carried. 15. Children must be under adult supervision at all times. 16. If you are riding a Musical Freestyle, please provide music and player. Arrange for your music system to be tested prior to your ride during a break or lunch. Please do not use your mobile phone to provide music. 17. All trash and manure is to be removed from show grounds. Consistent offenders will be fined $75 and/or banned from IEO shows. Note***** If time allows, arena may be open before show starts for competitors to lead horses around outside of the show ring. Note***** Lunging area may not be available. Lunging is at the discretion of the show manager. If you wish to lunge, you must check with show management first.